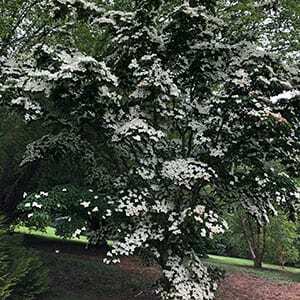 The Japanese Dogwood, Cornus Kousa is a deciduous tree with masses of brilliant white to pink flowers in spring. A small tree to around 10m in height although usually smaller in cultivation. Excellent as a feature tree and with its small growing habit it can be used in smaller gardens. Cornus Kousa Chinensis which has white flowers and excellent red autumn colour. Cornus Kousa ‘Miss Satomi’ with its clear pink flowers is a little smaller growing to around 5m in height, with deeper red autumn colour. Flowers are darker on the ‘sunny side’ followed by red fruit in summer. 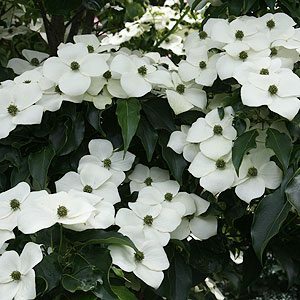 Cornus Kousa ‘Wolf Eyes’ An interesting cultivar with green foliage margined with white, creamy white flowers. Grows well in sun to part shade and has a nice broad layered habit. Cornus Kousa ‘Trinity Star’ is regarded as a ‘semi dwarf’ cultivar, well suited to smaller gardens. Brilliant white flowers on a nice shaped tree. Yes the flowers are a little ‘star shaped’. Generally available in 25cm pots though to 50L containers depending of variety. Very little care once established. Provide a sunny position sheltered from strong winds. A humus rich soil with will be beneficial to growth, dig in some well rotted compost before planting, good drainage is essential. Water in new plants with a liquid seaweed fertilizer and maintain moisture through the first summers. Light mulch will help maintain a cool root run however keep mulch away from the base of the trunk. Use at the rear of the border or as a feature tree.